Dr Sandeep Chaudhary is a distinguished endocrinologist (both adult and pediatric), Diabetologist and expert of metabolic disorders. 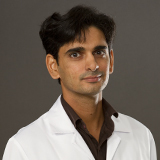 He brings with him more than 6 years of experience in Endocrinology and Metabolism. Dr Sandeep Chaudhary completed his M.B.B.S from Pt.B.D. sharma PGIMS ,Rohtak in 2005 and subsequently joined at nationally top 10 ranked prestigious Institute of Medical Sciences , Banaras Hindu University (IMS, BHU) where he completed MD in General Medicine in 2011. Following this, he worked as senior Resident in Endocrinology for 1 year at VMMC Safdarjung Hospital , New Delhi . Subsequently he went for advanced training in Endocrinology , Diabetes & Metabolism at one of the premier institutes of India i.e. The Institute of Post-Graduate Medical Education and Research and SSKM Hospital, colloquially known as P G Hospital, Kolkata. He completed his DM Endocrinology in 2015. He also got his Speciality Certificate in Endocrinology and Diabetes (SCE-Endocrinology) from the Fedration of Royal College of Physician of the United Kingdom in 2015. He worked as a Consultant Endocrinologist at ADK Hospital, Male' , Maldives for 2 years before joining NMC where he established the first Endocrine department . He is currently working as a Specialist Endocrinologist at NMC Specialty Hospital, Al Nahda, Dubai. His area of expertise includes all types of diabetes, thyroid disorders, endocrine disorders during pregnancy, pituitary problems & Adrenal disorders - including disorders in growth hormone and hyperprolactinemia, High cholesterol level and metabolic disorders, Hirsutism (excessive hair growth), PCOS, male and female reproductive endocrinology, CAH, Treating disorders of puberty(early or delayed); and gynecomastia, Osteoporosis and bone metabolic disorder. He has many publications to his credit in renowned national and internatonal Journals . He keeps himself academically updated by attending national and international conferences, workshops and courses. He is an active Member of American Association of Clinical Endocrinologists (AACE); Member of European Association for Study of Diabetes (EASD); Member of Endocrine Society (ESI), India; Member of Research Society for Study of Diabetes in India (RSSDI), South Asian Federation of Endocrine Societies (SAFES) ; other national and international organisations. He can speak English, Hindi, and Bengali.